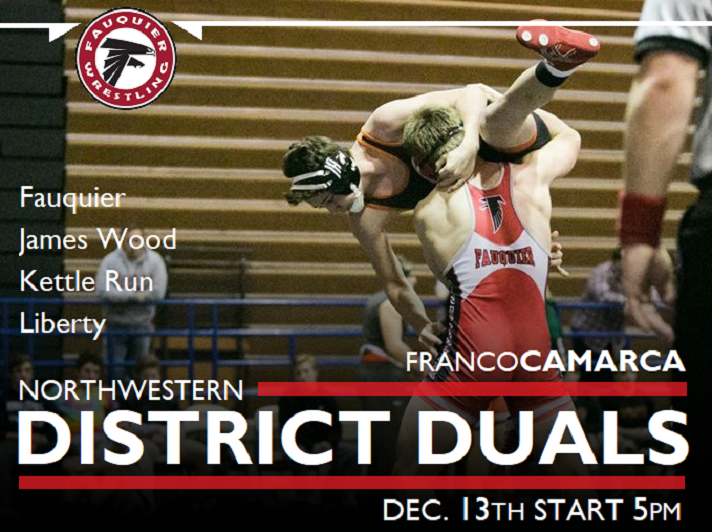 On Dec 13th the Fauquier wrestling team hosted the Northwestern District Duals #1. As the Sat., Dec 6th Falcon Duals was slated to be the teams first dual meet, it was cancelled making this mid-week Wednesday Duals team Fauquier first dual. A home event that brought the community together for a Pink Out cause. Having two wrestling mats down in the main gym, it was all about wrestling on this day. But the Falcons not only wanted to honor and show support in the pin against Cancer but show case to the local Fauquier fans what unity is all about. An up-lefting event it was. The Northwestern District Duals #1 had four teams coming together for a Quad meet. Just to keep everyone informed a Northwestern District Duals #2 meet is scheduled for an Jan. 2018 date as more Northwestern district teams will wrestle again for post season seeding purpose. The Falcons went 3-0 and proved to Fauquier Nation that they could Pin Cancer by recording a total of 15 pins during this meet - most of all teams during these Duals. Below is the recap of each round. Rd 3 - Fauquier won 43 to 36 in an exciting district dual match. Fauquier went 8 and 3 with 4 pins. Gino Camarca, Kyle Budd, Franco Camraca, and Sam Fisher all recorded pins for team Fauquier. Note: Fauquier went 11 and 2 with 7 pins and 4 forfeit. Note: Fauquier went 10 and 3 with 4 pins and 2 forfeit. Note: Fauquier wins 43 to 36 in an exciting district dual match. Fauquier went 8 and 3 with 4 pins.